Chew Kee Store (Chinese herb store) once owned by Chinese doctor Chew Kee during the California Gold Rush about 1855. It is an example of a rammed-earth building, similar to adobe, but the walls are not of mud brick. Chew Kee returned to China about 1922 and he deeded the store to Fong Chow Yow, his adopted son. Know locally as Jimmy Chow, he took care of the store until his death in 1965 The store was rebuilt in the early 1980s. 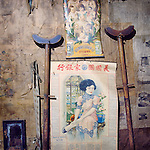 This intact store complete with herbs and products of the late 1800s and early 1900s is one of four buildings of Fiddletown's once thriving Chinese community. Chew Kee Chinese herb store, Fiddletown, Calif.